DEONTAY WILDER dismissed suggestions Tyson Fury will provide him with his biggest challenge, after weighing in more than three stones lighter than his rival ahead of Saturday’s fight at Los Angeles’ Staples Center. Fury smiled as he entered the stage shirtless and remained relaxed as he weighed in at 18 stone four pounds, engaging with his fans – who convincingly outnumbered Wilder’s. The two were then kept at a safe distance for their final face-off, following Wednesday’s press conference when they and their two entourages threatened to get violent during a heated confrontation. Wilder, 33 years old and 15st 2.5lbs, again wore the mask he uses to demonstrate his readiness to fight, and he said: “(This is) definitely the most important but definitely not the most difficult. I (have) fought way tougher guys than him. “My opponent last fight (Luis Ortiz) was way tougher than him. This is just another step to get to where I want to go – there will be one champion (in the heavyweight division), one face, one name, and he’ll go by the name (of) Deontay Wilder. Saturday’s fight will take place in a 20ft ring – four foot smaller than the maximum permitted size, which the 30-year-old Fury used to memorably defeat Wladimir Klitschko – favouring the aggressive American. Earlier, Wilder had said: “If people didn’t think I hold all the marbles in boxing, after this fight, there ain’t going to be any question who holds the marbles. “The promotion has been amazing and I thank God for Tyson Fury because I have had to promote all of my old opponents. They were too scared to say what they would do. “This event is big for me, all the guys before brought something to the table to take me to the next level. Wilder may not be the polished champion the Klitschko was when Fury unexpectedly outpointed him three years ago this week, but he is widely considered a more powerful and more explosive puncher. 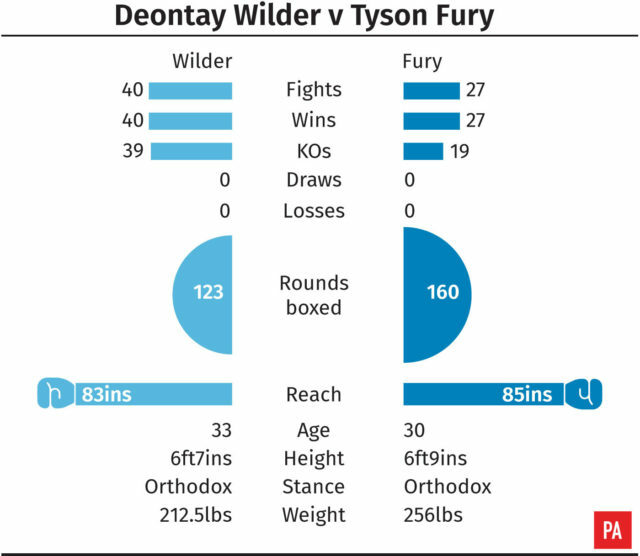 The 30-year-old Fury recognises the extraordinary power that he possesses, but he also insists that Wilder is so flawed that he should still pose little threat. “He punches hard but he didn’t fight anyone until he’d had 30 fights,” he said. “You can only knock out who’s in front of you but if you’re matched easily you get to 100-0. “People are afraid before they get in there, like with Mike Tyson. They were just looking for a comfy place on the canvas. “If I can’t beat Deontay Wilder then I’m not very good, simple as that. If I can’t beat Wilder I’m not the man I think I am. If I win a close fight I’ll class it as a loss because it’s not enough for me. There has also been little in the final days to change the widely-held view that the likeliest outcomes are a Wilder stoppage victory or a negative Fury earning a decision, but the latter’s promoter Frank Warren said: “I don’t think this will be a dancing contest. To fight (Wilder), you have to put him on the back foot.